Fin-S Charters, LLC | Morehead City NC Fishing Charters with Capt. 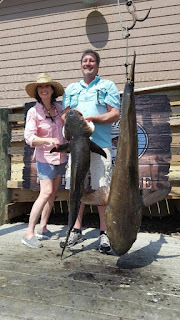 Daniel Raeburn 252-241-3590: Mid May Cobia! So the rush is here, the Cobia showed up this week! Cobia fishing was good during the week, the picture is from Capt. Chris with a slob they caught last week. For this weekend there was plenty of bait and boats with a few cobia being caught. Every bait ball had 20-30 boats on it so we anchored up and bottomed fish. Had plenty of rays and sharks, but no cobia for us this weekend. It makes it hard when there are a couple hundred boats doing the same thing. If you aren't into the cobia there are plenty of spanish macs and bluefish around the inlets, and the flounder are still on the reefs.